Buying a brand-new set of desktop speakers can be a thrilling experience, even for the most seasoned audiophile. The feeling of anticipation as you pull them out of their box can make it hard to consider anything other than instantly plugging them in. Before you go throwing them on your desk and blasting your favorite tunes however, take some time to think about their placement. Correctly placed speakers can make a world of a difference when it comes to the proper reproduction of sound and the overall listening experience. The following three steps will help ensure you get the most out of your desktop speakers. Isolate your speakers from the surrounding area. Whether it’s with simple foam feet or a specifically designed stand, isolating your speakers with an absorptive material will help prevent unwanted vibrations caused by lower frequencies. Don’t let the reflected noise from your desk diminish the controlled bass your speakers have to offer! Aim your speakers towards your ears. This may sound obvious, but there’s a particular reason why this is so important. Here’s the “Acoustics 101” explanation: When sound leaves your speakers, it travels in waves. High-frequency sounds, such as the clash of a cymbal, have a short wavelength and spread out much slower than lower frequencies. When you consider how close you are to your desktop speakers, it’s likely these higher frequencies will go unheard unless they’re directed towards your ears. Using a tilted stand to point your speakers (specifically the tweeters) towards your ears will ensure you’re not missing out on all those high notes! 60 degrees of separation. 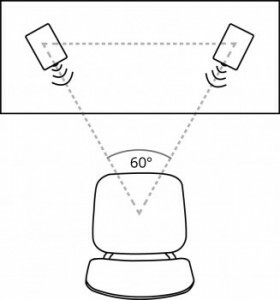 In order to give some spatial presence to your audio, make sure your speakers are a sufficient distance apart and equally distant from your ears. As most music and film audio is released in stereo (meaning sounds are divided into two or more independent channels), having your speakers sufficiently separated will give the illusion of sound coming from various directions. An easy way to ensure proper placement is by taking a protractor and forming an equilateral triangle between you and your speakers. That’s it – simple yet effective! And while there’s certainly much to be said regarding the benefits of high-quality sound cards and proper wiring, these three adjustments will have you well on your way to immersing yourself in wonderfully balanced, captivating sound.